Pro-Line Winter Meltdown Sale « Big Squid RC – RC Car and Truck News, Reviews, Videos, and More! Pro-Line has just announced their limited time Winter Meltdown Sale. The Winter Meltdown Sale only lasts through this Sunday and offers 15% off site wide on Pro-Line products. With spring firmly in place in most parts of the country (we feel for you guys up north getting snow today! ), it is certainly time to get your trucks ready for bashing season. Pro-Line offers so many different great upgrades- from Badlands tires, to RECON G6 certified ultra reservoir shocks, to their latest in race bodies and tires, Pro-Line has the goodies you need to turn your truck into a trick custom build. 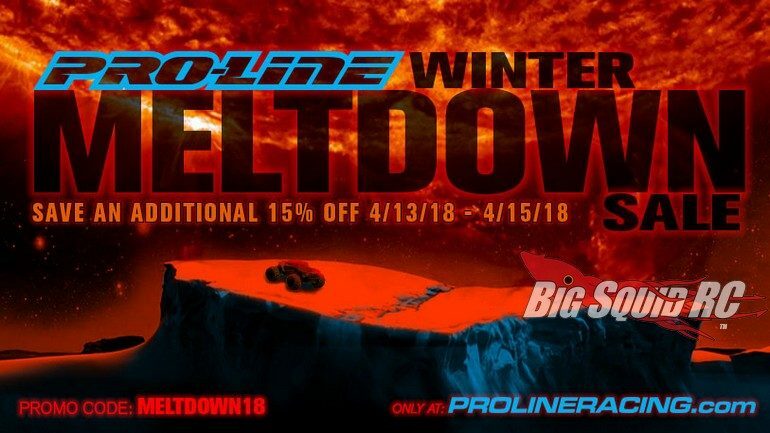 To get the 15% off, all you have to do is use the discount code “MELTDOWN18” over on Pro-Line’s Official Website. Catch up on more Pro-Line News right here on Big Squid.